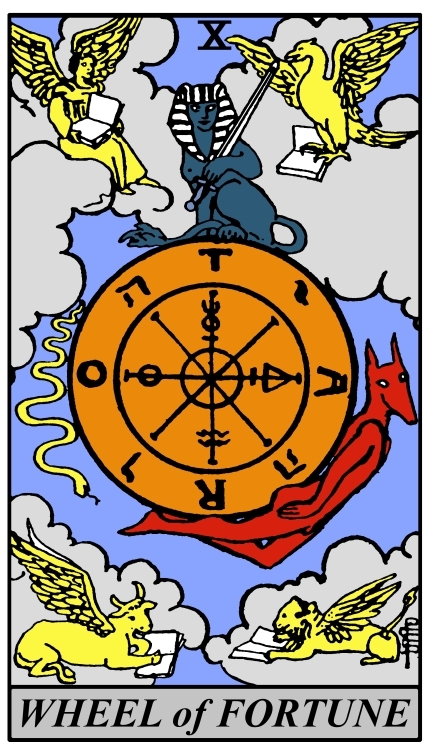 The Rider-Waite Wheel of Fortune Tenth Tarot Trump Card. Recoloured Image: The Tarot Deck. 10/10/10 10:10. We place arbitrary importance upon dates by virtue of the way we count them. But counting derives from our understanding of time in the first place. Whether it's our awareness of the time of day or the passing of seasons, or our larger grasp of death, we invented numbers because we can distinguish between past, present and future. Numbers are hieroglyphs, keys to the mathematical logic and principles that dictate the universe, and a pictorial language that represents our understanding of time. In other words, they encapsulate a paradox. They are both the encrypted symbols of mysteries we will never fully understand and our tools for unlocking those mysteries.